Ammonia-free Screen Cleaner Foam safely cleans computer monitors, LCD, LED and Plasma TVs, HDTV tablets, laptops, PDAs, GPS devices, game consoles and smartphones. Innovative, nondrip foam formula removes smudges, fingerprints and dirt without streaking or scratching sensitive surfaces. Antistatic protective coating helps keep screens cleaner longer. 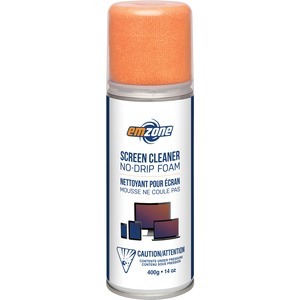 Screen cleaner includes a microfiber cloth.